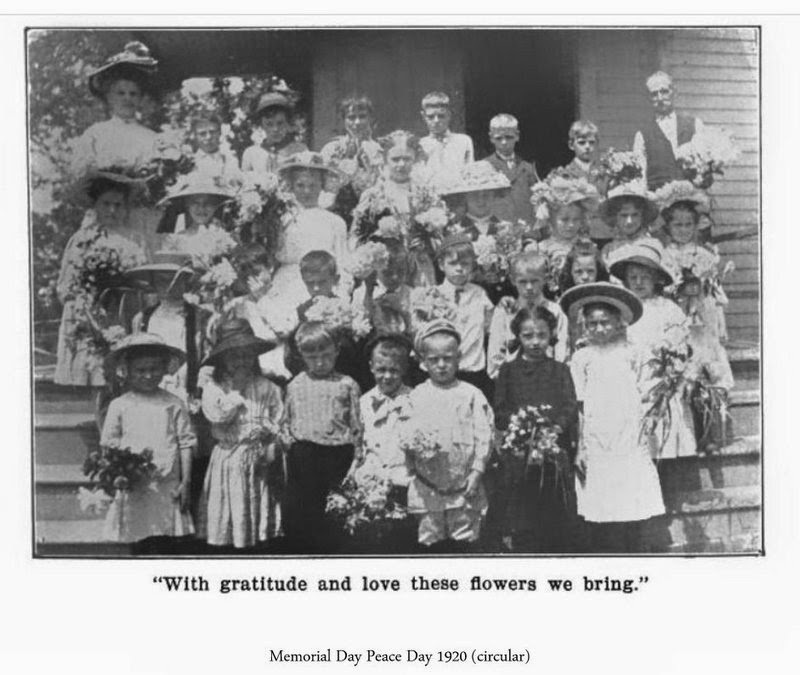 Many U.S. holidays have become associated with long weekends, sales, and parties. This is not necessarily a bad thing—in the case of Memorial Day, for instance. Men and women died fighting to keep the USA going. As well as remembering the dead, we’re celebrating what they fought for, and the commercialism is part of who we are, warts & all. However, the holiday commenced, originally not as an excuse for sales or barbecues or the date after which white shoes may be donned. 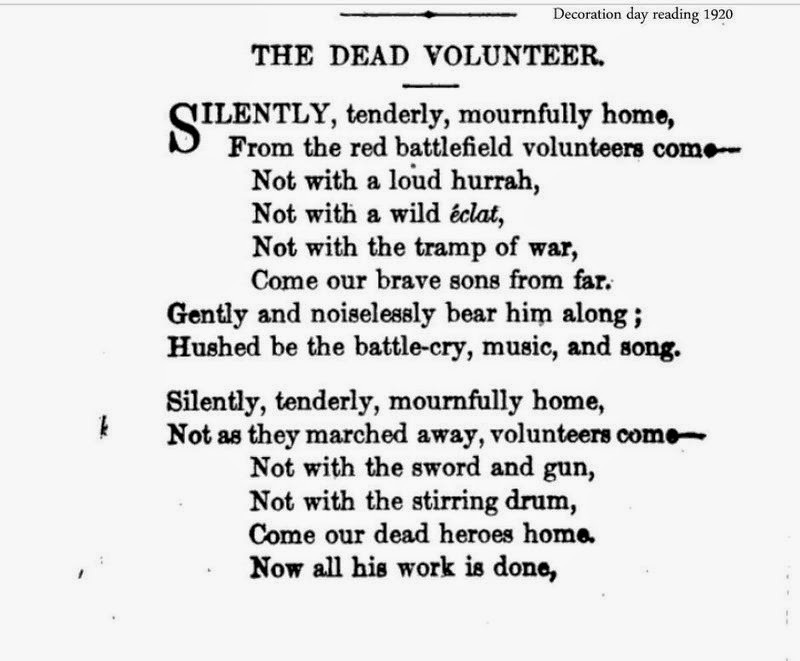 It started out as Decoration Day, a day of remembrance for the Civil War dead. 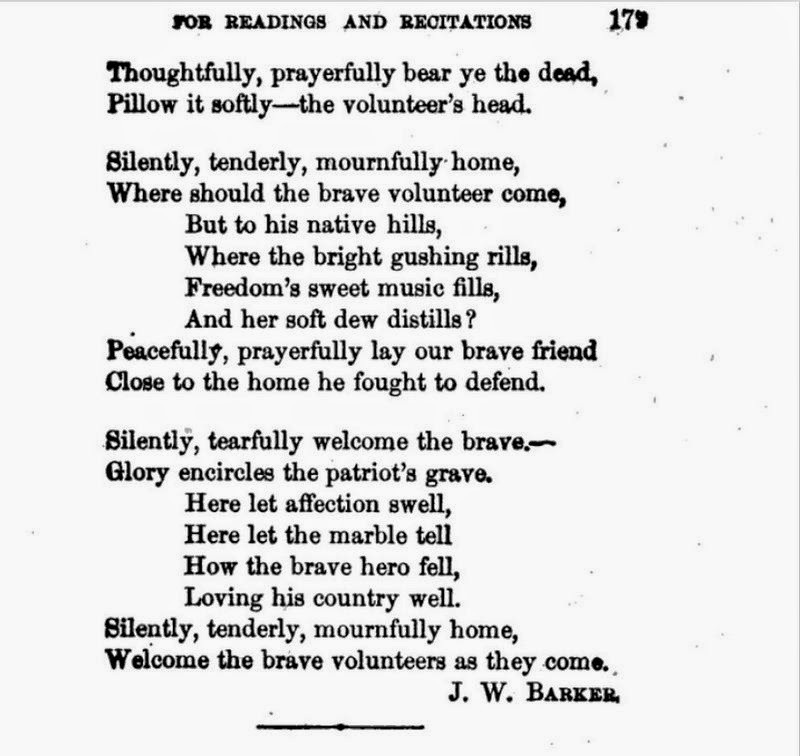 In 1920, when this poem was published, the Civil War was vividly within people’s direct experience as well as their memories. The poetry in the book is of its time, and bound to be sentimental and sad, not so appealing to the ironic 21st century sensibility. But our blog’s about offering insights into social history, and poetic recitations were still part of everyday life in the early 20th century. This one’s more restrained than the average, and all the more moving, perhaps, for that reason. You can read our other posts about Memorial Day here, here, here, here, and here. Thank you. Although I have not yet reached 'real' old age I can still remember this day being called 'Decoration Day.' I am sorry our schools have stopped teaching our history and that our children really know nothing about the Civil War...thank heaven for Ken Burns and bloggers! Thank you for posting this, and a big THANK YOU to all the men and women who have served this country. I have to comment on that last poster, too. I don't know where she or he lives but here in CT children are definitely being taught American History and about the Civil War. True it's not the "same old" history that used to be taught in the 60s and 70s, all old-man generals and so-called glorious battles. Now my kids are learning how the Civil War affected ALL Americans, rich and poor, black and white, young and old, men and women. It's not just white male history any more, no matter what certain political extremists claim. American history was made by a LOT of different people and it's time they had a voice too! Now going to our town's parade which is nearly 100 years old tradition and bigger and better each year. We Never Forget!